I have 14 years experience as an educator. I have taught Kindergarten (6 years), Fifth grade (3 years), Sixth grade (4 years), and this is my first year as a Second grade teacher. My name is Tahuita Ford. I am from Uniontown. I have one daughter, Aliyah. I am a twin and have seven other siblings. In my spare time, I enjoy cooking, organizing and cleaning, and being outdoors. 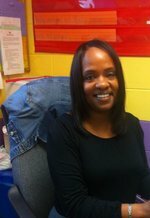 I have 18 years of experience working with children, 14 as a teacher. All of my experience as an educator has been in the Perry County School System. I decided to make elementary education my life's work because I believe that a child's education is the most valuable thing in the world. I enjoy every aspect of teaching and have realized in my years that children can teach us just as much as we teach them. This is one of my favorite things about teaching.